DeWalt has a well-earned reputation for quality, sturdy equipment, and the DPW4240 is no exception. This unit delivers 4200 PSI at 4 gallons a minute and will get big jobs done quickly. The DPW 4240 is powered by a commercial-grade Honda engine and features a General TX commercial-grade pump. All the machines parts are heavy-duty. Steel braid reinforced hose, oversized 13 inch double-sealed pneumatic tires and a solid steel axle create a quality commercial unit that will hold up to demanding use. 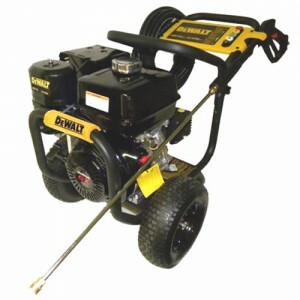 Here are the main features of this commercial pressure washer. •Commercial grade engine. Durable, starts easy, & runs quietly. •Ceramic pistons run cooler, will last longer, & can be rebuilt. •Thermal relief valve protects the units pump from overheating. •Unit features Five quick connect spray nozzles: 0°, 15°, 25°, 40° & soap nozzle. •Solid steel 5/8″ welded axle with 13″ double sealed pneumatic tires for dependability.